Discover has released two new commercials, highlighting that no tough talks are necessary when it comes to annual fees because Discover has no annual fees on any card. 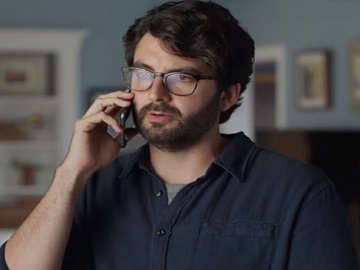 While one of the spots features a guy getting ready to make a phone call and be tough with the Discover customer representative, the second one features the same guy “talking tough”. After cheering himself up, saying he can do this, he calls the Discover and says he likes their card, loves all the cash back and security features, but he’s not going to pay an annual fee. “I’m just not gonna do it,” he emphasizes. Receiving a simple “OK” in response, he is confused and delighted to find out, shortly after, that Discover has no annual fee on any of its cards. “So it wasn’t my tough guy act?” the customer asks, making the Discover employee (played by the same actor) that Discover just does not have annual fees. Relieved, the guy making the phone call reveals he’s been working on that for a long time and that, if they had talked a month before, that would have been a whole different conversation. The commercial ends with the voiceover saying “No annual fee on any card, only from Discover” while on screen several Discover cards – such as Cash Back, Student, Travel and Secured – are featured along with a link to the section “No Annual Fee” on the bank’s website for viewers to visit it.